Open since 1976, Port Lympne Wild Animal Park is located on Aldington Road in Lympne, Hythe, Kent in the UK. The 600 acre park is famous for its conservation work and is proud to bring over 90 endangered and rare species of animals to the attention of the general public. Altogether, 650 animals live happily at the park and can be admired by visitors every day of the year. Your ticket includes free parking, a visit to the education center and a tour of the park. Plan on taking 3-5 hours out of your day to enjoy all that the park has to offer. The grounds of the park are beautiful, displaying gorgeous plantings from around the world. In fact, many people choose to host their weddings and other private functions in these beautiful surroundings. Rambling through the park, visitors can enjoy animals of all kinds from every country. The collection of canines includes Canadian Timber Wolves, Asiatic Wild Dogs, African Hunting Dogs and more. Felines include both Siberian and Indian Tigers, Snow leopards, and Ocelot. Hoofed creatures include the American Bison, the Water Buffalo, and the Roan Antelope, among others. The collection of monkeys and great apes is extremely impressive, and visitors at lunch-time can enjoy the rare treat of viewing a family of Mountain Gorillas enjoying their daily fare. Visiting the park is a great family day out since admission is quite reasonable and is also discounted for the elderly and people with disabilities. Additionally, there are wheelchair accessible paths in place to accommodate people who use wheelchairs and parents with babies in strollers. The park is comfortable and accessible with restrooms conveniently located throughout. 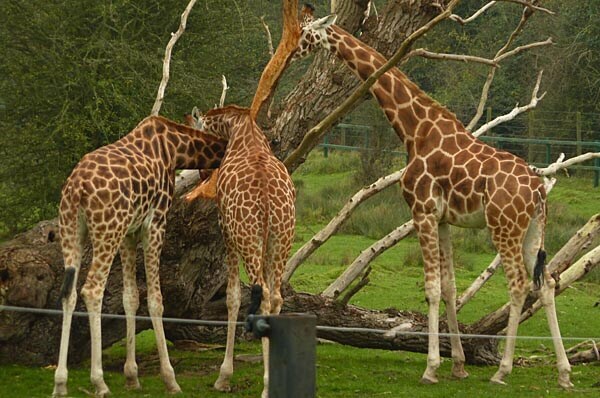 From large animals like the African Elephant and the Black Rhino to rare birds like the Ostrich, you will enjoy one of the finest collections of rare animals on earth when you visit the Port Lympne Wild Animal Park. Visiting hours are 10am-5pm every day. Last updated by Suzanne Bennett on 03 May, 2012 in Destinations.